Published in Auto Accident Safety / Auto Safety. We all listen to the car radio while driving. Sometimes we sing along to our favorite tune or take in the news of the day. But a recent study reveals that listening to the radio while driving is a bigger distraction than originally thought, and may lead to more auto accidents. The study focused on what’s known as the “perceptual load theory” of attention. According to this theory, humans have a finite quantity of attention and, once a person reaches the maximum amount, he or she cannot process any other information. 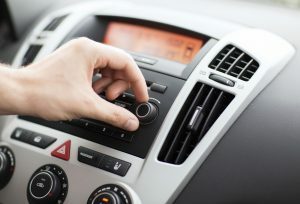 The study investigated whether information delivered to one sense (hearing the radio while driving) could affect the awareness levels in a different sense (seeing the road while driving). Using a driving simulator, researchers measured whether listening to a traffic report on the radio affected a driver’s ability to absorb and process visual information. The study included 36 drivers. Half listened for when the traffic reporter changed from a male to a female voice — this is classified as a low-attentional load task. The other half listened for updates on a specific roadway — this is classified as a high-attentional load task. As the drivers maneuvered their vehicles, researchers measured various aspects of their performance. Some visual surprises were also tossed in from time to time: an elephant or a gorilla on the side of the road. No matter what drivers are listening to on the radio, they’d certainly notice a giant animal on the side of the road, right? Not according to the study. Seventy-one percent of the drivers in the low-attentional load group noticed the presence of an elephant or gorilla. But in the high-attentional load group, only 23 percent noticed an animal on the side of the road. The study confirmed that perceptual loads do, indeed, have sensory cross-over effects. What does this mean? That paying attention with one sense while driving can prevent other senses from being as attentive as they normally would. While more research is necessary to corroborate the findings, the results seem to indicate that attentional load is a significant contributor to driver distraction and, as a result, to auto accidents and accident-related injuries.